Entering season 4 of the T1 PRIMA TRUCK Racing Championship and in keeping true to its commitment of introducing first-of-its-kind initiatives as leaders in the Indian commercial vehicles space, Tata Motors will showcase an all-new powerful 1000 bhp T1 PRIMA race truck in Season 4 of the championship. With over double the power in comparison to the T1 race trucks competing in season 4, the all-new 1000 bhp T1 PRIMA race truck will further add exciting dimensions of speed and character to T1. Similar to race trucks that compete under the broad umbrella of the FIA in the United Kingdom and Europe, the all-new 1000 bhp T1 race truck is a perfect example of the capability and flexibility of Tata Motors next-generation World Truck, the Tata PRIMA. The engine of the all-new 1000 bhp T1 race truck is being developed in collaboration with Cummins Inc. of the U.S., a world leader in diesel engines, enabling Tata Motors to not only set new benchmarks in T1 and the sport of truck racing, but in the Indian commercial vehicles space. The new T1 race truck is the most powerful truck built in India by far. Developed to deliver unmatched power and acceleration of 0-160 km/hour within 10 seconds and a torque of 3500 Nm @ 1600 – 2200 rpm, the new T1 race truck is based on a 12 litre ISGe Cummins engine, mounted in the center of the chassis for equal weight distribution, with enhanced fuel delivery and air flow, producing 1040 HP @ 2600 rpm. The power is managed by an all-new ZF 16-speed gear box, making it fastest race truck developed by Tata Motors. With high performance rotating parts made of special materials, the engine is meant to withstand high temperature & pressure that a race truck is subject to on a race track. After having hosted three successive T1 seasons, we at Tata Motors are happy to announce our next big innovation in the form of the 1000 bhp T1 PRIMA race truck. Built with specifications similar to that of trucks that race globally, the vehicle was developed in a record time 12 months – a demonstration of teamwork, speed and capability. With this new track based machine, we are truly ahead of contemporary; we are FUTURE READY and through T1 we’ve proved time and again to showcase a distinctive partnership between sporting and technological excellence for the Tata Motors brand. In India, Tata Motors and Cummins Inc., USA, have a joint venture company called Tata Cummins Pvt. Ltd., established in 1994, developing high performance, reliable and durable engines in the range of 75 to 400 HP, that not only comply with current and future emission norms, but are also serviceable globally. The company has its state-of-the-art facility in Jamshedpur, aligning itself with the world-class manufacturing standards, consistently exceeded customer expectations. Season 4 will also see accomplished racers from FIA’s European Truck Racing Championship (ETRC) competing in the championship for the very first time. The ETRC will be represented by six racers from the rest of Europe, who will compete in the PRO CLASS category alongside six British drivers from the British Truck Racing Association (BTRA), who have raced in T1 since the sport was first introduced in 2014. Among these are Spanish Antonio Albacete, three time ETRC Champion (2005, 2006 & 2010), Hungarian Nobert Kiss, two time ETRC Champion (2014 & 2015) and T1’s first woman driver Stephanie Halm. In Season 4, Tata Motors has also partnered with some of the country’s leading automotive brands. These are WABCO – Official Braking Technology Partner, JK Tyre – Official Tyre Partner, Castrol – Official Lubricant Partner, Cummins – Official Engine Technology Partner and Tata Technologies – Official Technology Partner. 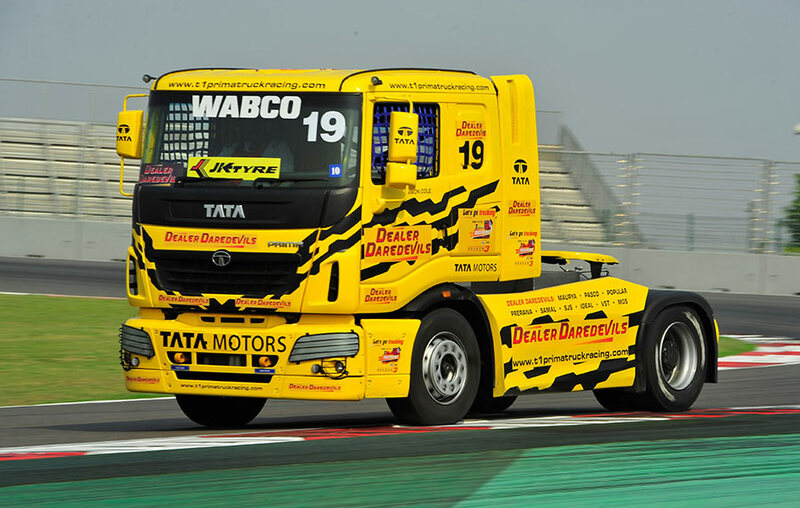 India’s only truck racing championship is organised by Madras Motor Sports Club (MMSC), with safety and performance standards as per the guidelines of the British Truck Racing Association (BTRA). Conducted under the aegis of FIA & FMSCI, the T1 Prima Truck Racing Championship will feature Tata PRIMA race trucks, built for the purpose. A one-make championship, six teams will compete in the PRO CLASS CATEGORY of the T1 PRIMA Truck Racing Championship.